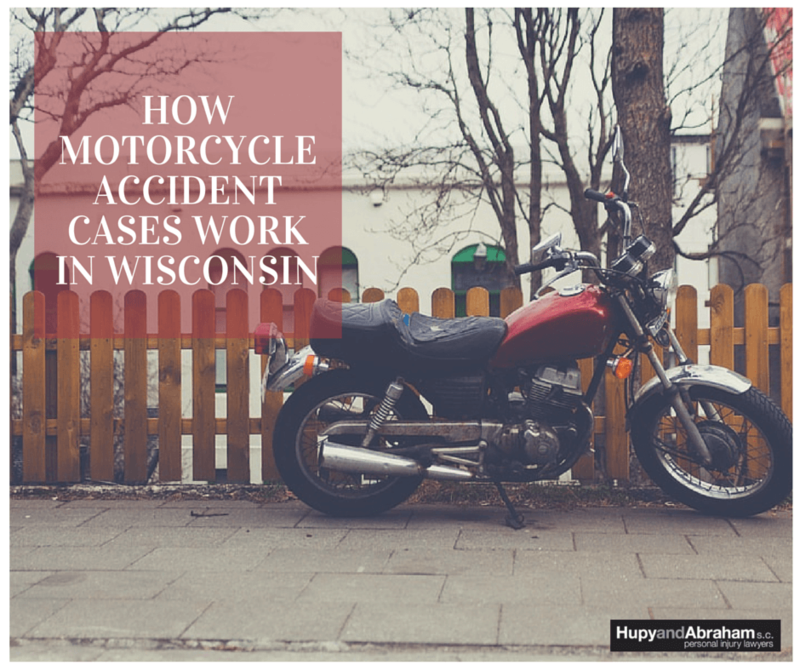 What To Know About Wisconsin Motorcycle Cases | Hupy and Abraham, S.C.
You’ve been hurt in a Wisconsin motorcycle accident that was caused by another driver’s negligence. You have the right to recover damages for your injuries, but that recovery is not automatic. Instead, you are going to have to take action to protect your rights and your recovery. How to collect evidence. It is important to get certain evidence at the accident scene, if you are physically able to do so and it is important to obtain evidence during the legal discovery phase of your lawsuit. This evidence may provide the facts that you need to win your case. How to get a fair settlement. Insurance adjusters try to minimize the payments made to motorcycle accident victims so that they can maximize the profits for their employers. Accordingly, you need to know how to negotiate with the insurance adjuster and advocate for the fair recovery that you deserve. How to use expert witnesses. Not all motorcycle accident cases require expert witnesses, but some cases may benefit from the testimony of accident reconstructionists, doctors, experts in the injured victim’s field of work, economists, or others. Generally, this is important if the cause of your crash, the extent of your injuries, or your ability to work are contested. Whether you were partly at fault. You may be able to recover damages if you were partly at fault for the accident, but your damage award may be reduced by the percentage of fault that is attributable to you. Whether you have legal standing to sue. If you were hurt in the crash and you are a competent adult then you have legal standing to sue for damages. You may also have standing to sue in other limited circumstances. How long you have to sue. Wisconsin, like all states, has a statute of limitations that limits the amount of time that you have to bring a lawsuit. If you fail to file your case in court before the statute of limitations expires, then your case may be dismissed and you may be unable to recover damages. Whether you need a motorcycle accident lawyer. If you’ve been hurt, then you may benefit from working with a lawyer who can help make sure that all of your rights are protected and that you get the full and fair recovery you deserve. Motorcycle accident injury victims who are not represented by counsel often do not recover as much as they could have with the help of an attorney. When you understand how a case works then you can take action to protect your rights. You can start by contacting an experienced motorcycle accident attorney who is also a rider and who is committed to getting you the fair and just recovery that you deserve. To learn more, please download a FREE copy of our book, The Ultimate Guide for Motorcycle Accident Victims, today and please start a live chat with us at your earliest convenience.